The CAPS annual year-end barbecue was held at Davenport Hall on May 13 as a final meeting/event in the club year (aside from outings to be held during the summer). 54 members of the club and a number of guests attended and were treated to a wide selection of excellent potluck dishes, many of which were completely consumed by the end of the meal. Prior to the dinner everyone circulated through the nearly 100 photo strong display of entries to the club’s spring competition. Scotty organized a People’s Choice award which determined the photo deemed most popular by the crowd in attendance. There was universal admiration for the quality of the images on display this year. After the dinner the winners of the spring competition were announced. Each person was given the opportunity to describe how they captured their photo and what appealed to them in it. These descriptions were often entertaining, especially Michelle Zemlak’s story about the wet photography of her cat, and all were thought-provoking in that they gave others in the club new ideas for photography in the future. To wind up this section of the evening the Photographers of the Year were announced. Full details about these competition winners and their photos can be seen in Scotty Roxburgh’s excellent newsletter which can be accessed here. CAPS would like to thank all those who slaved in the kitchen, and helped with the setup and takedown of the hall. We also wish to thank Rob Gilgan for the use of his BBQ and again booking the hall for us, as well as the Davenport Place Community Association for making their facility available to us. We also had a door prize which was won by Dave Kerby. 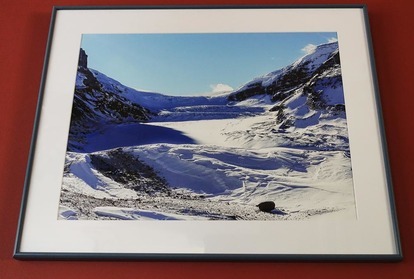 It included a frame (donated by Scotty Roxburgh), matting and printing of Dave's favourite picture. This is the final product of his prize. The following images show how our official photographer of the event, Peter Fuzessery, captured the evening’s festivities. Thank you for your photo essay, Peter!